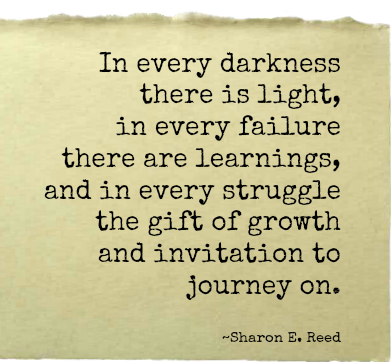 In every darkness there is light, in every failure there are learnings, and in every struggle the gift of growth and invitation to journey on. As we journey through life, sometimes we have to struggle to uncover the gifts along the way. Sometimes we must step away from the known, the familiar and the comfortable, before we can finally make our way back home. Sometimes we must face fear or the temptation to quit, that we might learn to overcome and persevere, and in doing so, develop the courage to live our convictions out loud. Sometimes we need to be challenged to finally know our value, stretched to learn our limits, and tested to understand our strength. Sometimes we must climb hills to develop endurance or visit the valley of tears to know true compassion, for how can we offer to others what we have never experienced for ourselves? Sometimes we must endure the disrespect of others on our own journey towards self-respect, or have our egos shattered and dismantled before we can learn to see the true light of humility in leadership and service to others. Sometimes we must suffer pain to know healing or deep sorrow to know joy. Sometimes we must endure the sting of betrayal to know the honor of truth, or suffer the pain of false masks, that we might finally learn to walk in the truth of who we authentically are. Sometimes we must experience painful loss that we might know gratitude, uncertainty that we might know Faith, and disappointment that we might know hope. Sometimes, we must simply journey through the dark forest of our lives to reach the clearing on the other side — for in every darkness there is light, in every failure there are learnings, and in every struggle the gift of growth and invitation to journey on. I’m curious…In what ways have you been tested, challenged or stretched on your own journey called life? Do you view these challenges as gifts of growth or another burden to bear? How have your struggles strengthened you, enabling you to become a wiser learner and leader in your own life? What are the lessons of your own journey? Gifts of growth, I like that thought. Loss,betrayal,disrespect,temptation to quit,all of these are gifts that challenge our character and strengthen our souls. My journey has ups and downs but I keep mindful of the fact that I am here to grow.I choose to smile as I reflect on my struggles and enjoy the character that I build along the way. Its my hope that I continue to love life and appreciate all of the lessons that come my way. How have your struggles shaped and influenced your personal leadership journey? How might a perceived setback actually be a blessing in disguise?